As some of you know, we have a wedding in a couple of weeks. If you follow me on Instagram, you probably have seen all the creative ways I came up with to make my daughter’s bridal shower look like a million bucks for so much less money. If you are not following me on Instagram, well get over there and follow my crazy life and thrifty ideas. One of the many things I did was to upcycle some items we already have. I’ll share more of them at a later date. Today, I’m focusing on these adorable wine cork keychains we made as favors. 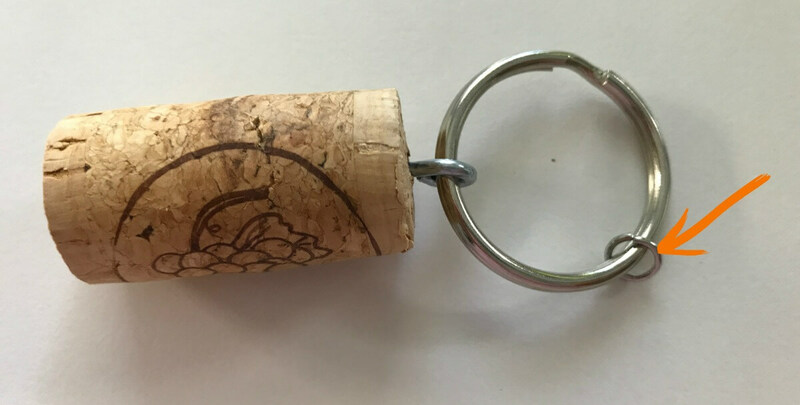 First, I know what you are asking…why wine cork keychains for bridal shower favors. Well, to start with, the wedding is…you guessed it…at a winery. Clever right?! The second reason is because, we have a ton of wine corks. And no we are not drunks…although it might seem like that with that many wine corks. The truth is, we’ve been saving them for many many years. And, I only needed 45 of them. Spread that over say 20 years and that’s just a few each year for us. 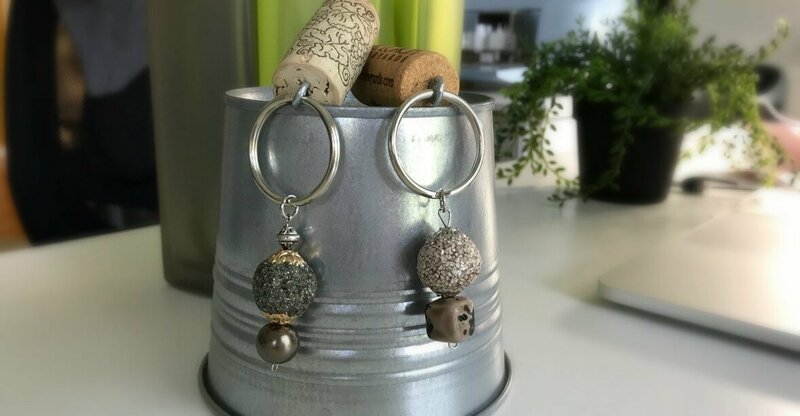 These wine cork keychains were a hit and so inexpensive and super easy to make. As a matter of fact, I put one together as a sample and my 13 year old niece (with a little help from grandpa) made them all. Super easy! Start by screwing in 1 screw eye into the center of one side of the cork. It doesn’t matter which side unless there is some writing on the cork that you would prefer to have shown from top to bottom of the key chain. The next step is to simply attach the split ring to the screw eye. Super easy! This step is as easy as adding the split ring. Simply feed the jump ring around the split ring just as you would add a key. Boom! Now you are ready for the fun stuff..the beads! This is where you can get creative! Slide one, two or three beads (depending on the size of the beads) onto the eye pin. If you want more beads, then just get a longer eye pin. The 1 1/2″ seemed to work well for us. If the whole on the bead is too big and it goes through the head of the eye pin, you can get spacer beads to start at the base so it doesn’t go through. This might even add a little extra glam depending on the spacer beads you choose. Tip: make sure there is enough room at the top of the eye pin to be able to loop it onto the jump ring (see below). Feed the top end (end without the eye) of the eye needle through the jump ring. Make sure you crimp it tight so the beads don’t fall off. And there you have it. 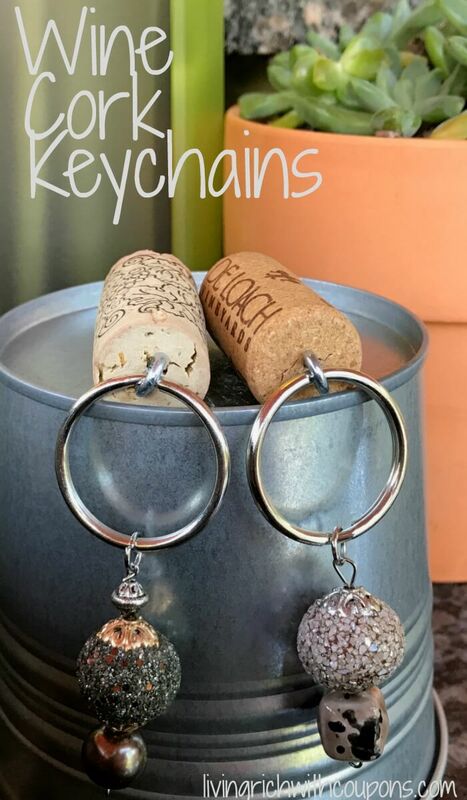 Pretty wine cork key chains! SpaghettiO’s Canned Pasta Just $0.54 at ShopRite!